Strangers Bar Silom soi 4 closed after smoke damage. It was so sad to see last night, the night of their anniversary, the performers and staff of Strangers sitting outside the closed bar for photos clutching anniversary bouquets. Strangers is a VERY popular drag show bar with shows every night. I fear they will have no work for a while yet. What happened? Early yesterday evening, before opening, smoke was seen billowing from the bar. Staff from other bars tried to enter with fire extinguishers but there was too much smoke. Not too long later the fire truck arrived with lots of firemen (and one fire-woman). A lot of excitement as they went in in gas masks and paraphernalia. Then after a while they took a powerful water drenching machine in. Completely doused the place and eventually left. At no time were there any flames to be seen and it looks like it might have been an electrical fault (only my guess due to the amount of lighting and audio equipment in there). Thankfully there was no sign of anyone being injured. Eventually several high hatted Bangrak policemen arrived and retired to upstairs in Telephone for what reason I know not. So last night, the bar was in darkness and cordoned off. I repeat again my sympathies to all the staff and management and hope that they are soon back in business. .... several high hatted Bangrak policemen arrived and retired to upstairs in Telephone for what reason I know not. they have airconditioned "quiet room " there I guess. Many of the most popular gay venues in Bangkok present multiple obstacles to a safe evacuation in case of fire. The dance clubs have the greatest potential for loss of life due to a combination of frequent over crowding, lack of emergency exits and automatic sprinkler systems. Even crowded first-floor establishments can prove deadly when everyone makes for the exit they entered through. There's nothing we can do about the hazards presented by the building's construction, layout or lack of protective systems. Our best protection is awareness. Upon entering a venue, look for an alternative exit. If you can't spot one, selecting a seat with an unobstructed route to the main entrance isn't a bad choice. And if you're a regular, ask one of the guys who work there how they'd get out in an emergency. They're sure to know because escaping out the back way in case of a police raid is one of the first things they learn when going to work at a new place. When climbing the stairs to your massage cubicle, keep an eye out for rear stairwells. And glance around the floor your room is on for windows. Once you begin to take notice of these things, it becomes automatic, like deciding what pocket your going to keep your cash in before you remove your pants. One man was killed and 36 others injured as a massive blaze swept through a shopping and residential complex in Bangkok's Chinatown district on Sunday night, just days after a fire at a nightclub in the Thai capital claimed dozens. A 45-year-old man was killed in fire that razed through a popular sauna in Sua Pa Plaza on Bangkok's Charoen Krung road in Pom Prab district. Bangkok's The Nation newspaper reported that the victim - identified by the police as Sanguan Saenkaew - was found by rescue workers on the seventh floor of the building early Monday morning. He is believed to be a patron of GSM Sauna at the time of the fire. Reports say about 60 fire engines fought the blaze which took hours to put out. The blaze was reported to have started at about 8.30pm on Sunday night. Some 100 people were evacuated from the nine-storey building via two firetruck ladders and a helicopter. The sauna - said to be popular among locals and travelers from Hong Kong and Taiwan - also operated a massage parlour on the fourth floor and guesthouse on the sixth floor. The incident follows a fire that killed at least 64 partygoers at Santika, an upscale Bangkok nightclub which was full to its 1,000-person capacity on New Year's Eve. The country's building and fire code standards has been called into question as police revealed that Santika had been refused a licence as an "entertainment venue" since 2004 due to safety concerns but it remained legally open as a restaurant while appealing that decision. It has also emerged that the club had no emergency lighting or sprinkler system, had only one door for entry and exit known to patrons and there were bars on the windows. A Singaporean, who was in the Thai capital over the New Year's Eve holidays and saw the fire engines on the streets, told Fridae that he shudders to consider a similar fate befalling Silom Soi 2 or 4 - well known clusters of crowded gay bars and clubs located on narrow dead-end lanes. Sign up on the doors tonight "Open tomorrow"
Lets see if it happens! I hope so. Strangers is not universally popular with other soi 4 business owners, but for me it brings a great dollop of fun to an otherwise staid soi. Yes indeed, it was only closed for two nights and now seems to be as busy as ever. I wonder why you say that it is not popular with other soi 4 businesses. It brings lots of people into the soi, giving atmosphere. soi 4 is NOT a death trap. One would hope that in the event of a serious fire that the family would open the gates to their compound giving two directions of escape. For a newbie, what’s so good about strangers bar ? The soi (the street itself) does not represent a death trap compared to the interior of the venues. The real hazards are the lack of emergency exits and lack of automatic fire detection and fire suppression systems (i.e., fire sprinklers). These same hazards exits in all venues I've visited in the Silom area, regardless of what soi you're talking about. If a fire originated on a lower floor, there is nothing to prevent the smoke and heat from rising rapidly and unimpeded to the floors above. For customers, prior knowledge of alternative exits (if they exist) offers the best chance of survival along with the determination to react quickly before a stampede ensues. All the bars on soi 4 are regularly (if not frequently) inspected by the fire department to ensure that there are sufficient illuminated exit signs and extinguishers installed. Perhaps there need to be stricter regulations. The Stranger was only closed for two nights and was the open again looking just as busy as normal. It was closed again last night apparently because of some Drag Race Final somewhere. And for Will's question --- it is a small (one shophouse) bar - the ground floor being for customers and the upper mezzanine or minstrel's gallery as the stage for a troupe of three or more drag acts. The acts are live interactive patter with the audience and mime. There is a DJ. They quote free admission but a compulsory purchase of two drinks. The bar gets very packed (bursting to the seams) with many straight couples and gays . They have a very active presence on Facebook. Digressing a tad, Banana Boys (Freshboys -Twilight as was) started out last night with a sign outside saying 'any drink 250 Baht', later to be replaced with 300 Baht per drink. 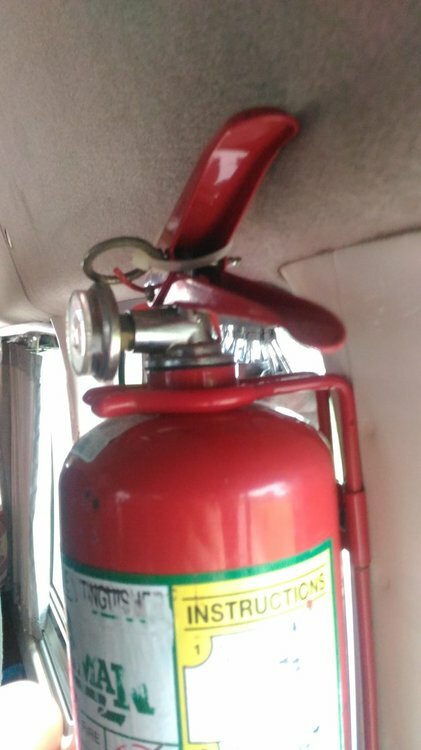 On the subject of fire safety and emergency exits, here pictures I took on a van last year. Equally important to having the right equipment is the training on how to perform during an emergency in order to come out of it surely and calmly. The device pictured has dual purposes. The pointed ends for breaking out windows and the opposite end is for cutting seat belts. They are widely available (and inexpensive) on sites like Amazon and Ebay. Did you notice the cable ties? 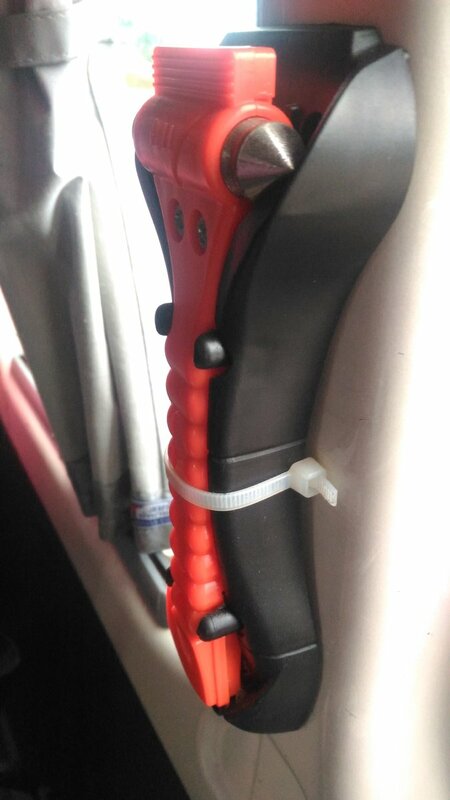 One should be able to yank out the cable ties with a pen or something similar. 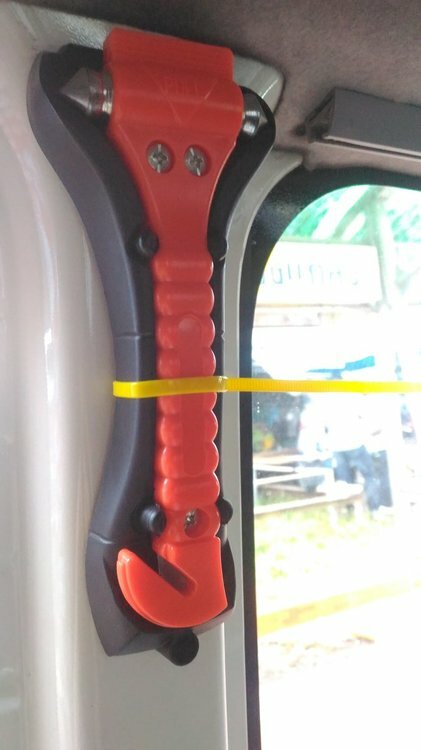 not those cable ties , you would need a knife ! Use a cigarette lighter. After all this is an emergency!